This year’s final for the BBC Radio 2 Folk Awards, a key highlight of the folk music calendar, will be presented by BBC Radio 2 presenter Mark Radcliffe and multi-award winning Gaelic singer Julie Fowlis, at the prestigious Belfast Waterfront on the 4th April, with a number of Manx musicians competing for success in several categories. The event, on its inaugural visit to Belfast, will showcase the best of folk, acoustic and roots music, but will also welcome an assortment of special guests, with performances from Cara Dillon, Paul Brady, Eliza Carthy, Lankum and The Wayward Band. A number of world famous performers have clinched awards at this ceremony during its nineteen year history. Those chosen for the final were initially amongst hundreds of hopeful young musicians, later reduced to ten lucky performers, who were invited to play in front of a live audience at a special BBC Radio 2 Folk Show concert in Kendal. Judges included Eliza Carthy and Tim Van Eyken. 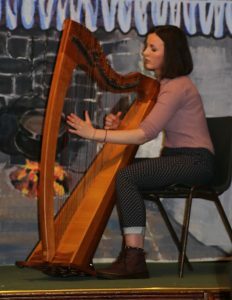 Mera Royle, who has been shortlisted for the BBC Radio 2 Young Folk Award, is known widely on the Isle of Man as a talented harpist and performs regularly at events across the Island, both with up-and-coming band Scran and as a solo artist. Now aged eighteen and a student at Ramsey Grammar School, Mera was introduced to the harp by Mike Boulton and later tutored by Scottish harpist Rachel Hair, but also plays the violin and whistle. Meanwhile, the five-piece band Ímar has been nominated for the Horizon Award, the category for Best Emerging Artist, with a strong Manx presence within this multi-talented group. The band includes musicians from Ireland, Scotland and England, including a previous winner of the BBC Radio 2 Young Folk Award. Although Ímar is based in Glasgow, two of its musicians have been recognised as gifted players for a number of years on the Isle of Man. Both Adam Rhodes and Tom Callister entered the local music scene at an early age and roved between several bands on the Island before their latest venture with Ímar. Additionally, Mohsen Amini of Ímar, who gave a stunning performance within the trio Talisk on the Isle of Man last year as part of Celtfest, is also shortlisted for the Musician of the Year Award. And finally, a Welsh group with long term links to the Isle of Man has been put forward for Best Traditional Track. 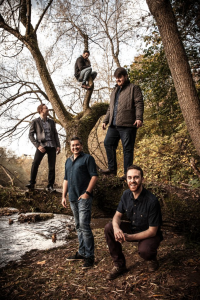 ALAW (Welsh for melody) draws upon a collected Celtic heritage and is described by Songlines Magazine as a Welsh folk super group, uniting three exceptional musicians. ALAW, which has recently played its debut concert at the Centenary Centre, includes talented accordionist Jamie Smith, who has now moved to Peel and made the Island his home. He’s also involved with the eponymous Jamie Smith’s Mabon, who have made several visits to the Isle of Man.